Three-disc CD-ROM multimedia presentation of the most important principles of the algebra- and trigonometry-based physics course. Content screens provide in-depth coverage of abstract and often difficult principles, building connections between physical concepts and mathematics. The presentation contains more than 350 movies'oboth animated and live video'including laboratory demonstrations, "real world" examples, graphic models, and step-by-step explanations of essential mathematics. An accompanying workbook contains practical physics problems directly related to the presentation, along with worked solutions. 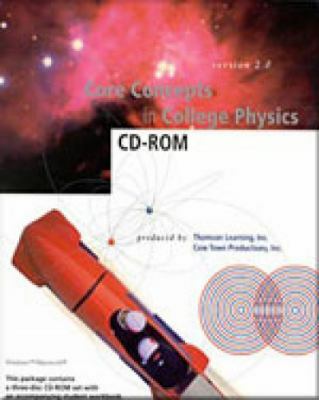 This CD can be used with any algebra/trig based introductory physics text.Thomson Learning Staff is the author of 'Core Concepts in College Physics Version 2.0' with ISBN 9780030337017 and ISBN 0030337011. Loading marketplace prices 10 copies from $1.91 How does the rental process work?